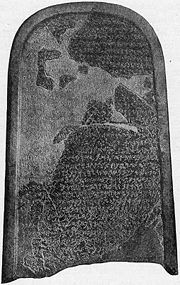 The Mesha Stele, also known as the Moabite Stone, is a black basalt monument bearing an inscription by the ninth century B.C.E. Moabite King Mesha. Discovered in 1868 at Dhiban, Jordan (biblical "Dibon," the capital of Moab), the inscription of 34 lines is the most extensive document ever recovered referring contemporaneously to ancient Israel. The stele was erected by Mesha circa 850 B.C.E. as a memorial of his victories, especially his revolt against the Kingdom of Israel, apparently undertaken after the death of Israel's King Ahab. Currently displayed at the Louvre Museum in Paris, it is 124 cm high and 71 cm wide and deep (44" x 27" x 27"), and rounded at the top. The monument was discovered in August 1868, by Reverend F. A. Klein, a German missionary to Jerusalem. 1.2 Reference to the House of David? The inscription is remarkable not only for its confirmation of several biblical events and personalities, but also in that it provides important insights into the religion of Israel's neighbor Moab and the existence of a previously unknown Israelite shrine in Moabite territory. It also contains the earliest known reference to the Hebrew god Yahweh as the national god of Israel. The Mesha Stele was shattered by members of the local populace who objected to its removal, but was later reconstructed. In addition, a squeeze (a papier-mâché impression) had been taken of the monument before it was removed. Both the squeeze and the reassembled stele are now in the Louvre Museum. Moab's subjection to King Omri of Israel as the result of the anger of the god Chemosh and Mesha's later victories over Omri's descendant (not mentioned by name) and over the Israelite tribe of Gad at Ataroth, Nebo, and Jehaz. Mesha's public buildings, his dedication to Chemosh, the slaughter of foreign inhabitants of the cities which he captured, the restoration of fortifications, and the construction of a palace and reservoirs for water. Mesha's wars against the Horonaim. With very few variations, the Moabite language of the inscription shares much in common with an early form of Hebrew, known as Biblical Hebrew. It is apparently an offshoot of the Canaanite language commonly in use between the fourteenth to eighth centuries B.C.E. in Syria-Palestine. The form of the letters supplies important information regarding the history of the formation of the alphabet, as well as, incidentally, the arts of civilized life of those times in the land of Moab. The inscription has strong consistency with historical events recorded in the Hebrew Bible, as several events, names, and places mentioned in the Mesha Stele correspond to those mentioned in the biblical accounts. For example, Mesha himself is recorded as the king of Moab and tributary to Israel in 2 Kings 3:4: “Now Mesha king of Moab was a sheep breeder, and he had to deliver to the king of Israel 100,000 lambs and the wool of 100,000 rams.” The god Chemosh is mentioned in numerous places in the Bible as the national god of Moab (1 Kings 11:33, Numbers 21:29 etc.). The reign of Omri is chronicled in I Kings 16, and the Mesha inscription records many places and territories (Nebo, Gad, etc.) that also appear in the Bible. Finally, 2 Kings 3 recounts a revolt by Mesha against Israel, to which Israel responded by allying with Judah and Edom to attempt to suppress the revolt. Some scholars have argued that an inconsistency exists between the Mesha Stele and the Bible regarding the timing of this rebellion. The argument rests upon the assumption that the inscription's reference to Omri’s "son" means Ahab, while the Bible speaks of the revolt taking place during the reign of Omri’s grandson Jehoram of Israel. The accounts can be reconciled, however, by assuming that “son” means “descendant,” an interpretation consistent with the common use of language in the ancient Near East. The stele is also significant in that it mentions the Hebrew god YHWH. It is thought to be the earliest known reference to the sacred name of God as the God of Israel in any artifact. The stele also mentions that Mesha captured an Israelite shrine at Mount Nebo and dedicated its artifacts to Chemosh. Mesha also boasts of slaughtering the foreign (Israelite) inhabitants of Atarot and Nebo, the latter after being "told" to take the city by Chemosh. This shocking boast, however, is not unlike biblical descriptions of the actions of Israelite leaders like Joshua and David, who likewise carried out mass slaughters in the cities they captured at the behest of Yahweh. Nebo was apparently a town and shrine located on Mount Nebo, the legendary site where Moses glimpsed the Promised Land of Canaan before dying. The existence of such an Israelite shrine was previously unknown. Reference to the House of David? In 1994, after examining both the Mesha Stele and the paper squeeze of it in the Louvre Museum, the French scholar André Lemaire reported that line 31 of the Mesha Stele bears the phrase "the house of David," previously unattested outside of the biblical record. To arrive at this conclusion, Lemaire had to supply one destroyed letter, the first "D" in "[D]avid," to decode the wording. In 2001, however, another French scholar, Pierre Bordreuil, reported that he and other scholars could not confirm Lemaire's reading of "the house of David" in line 31 of the stele. Another ancient mention of the "House of David"—on a Tel Dan stele fragment—is generally accepted as more certain. While confirming the biblical account of the relationship between Moab and Israel in many respects, the Mesha Stele also presents a fascinating and differing perspective from that of the Bible. For example, at a crucial moment in the campaign to repress Mesha's revolt, the Bible relates that the prophet Elisha directed the Israelites to dig a series of ditches between themselves and the enemy. During the night these channels were miraculously filled with blood-like reddish water from the Edomite hills, which fooled the Moabites into believing the Israelite coalition had turned against one another, causing the Moabites to fall into an enemy trap (2 Kings 3). 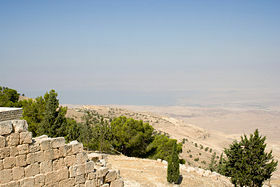 Retreating to Kir Hareseth, Mesha reportedly sacrificed his first-born son on the city walls, raising the morale of his troops and causing the Israelite coalition to retreat. No mention of any military setback or the sacrifice of his son is mentioned in Mesha's own inscription on the Mesha Stele. Instead, he portrays himself as completely victorious, regaining all the territory of which Israel had previously deprived his nation. Rather than Yahweh miraculously defeating the Moabites with Elisha's help, it is the Moabite deity Chemosh who defeats Israel as a result of Mesha's piety and devotion. Note that in the original text on the Mesha Stele, some words start at the end of a line, but end at the beginning of the next. Where possible, this translation reflects this writing. 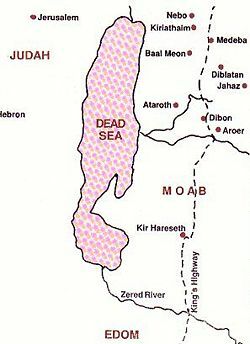 Map of ancient Moab shows Atarot and Dibon, the site where the Mesha Stele was discovered, due east of the Dead Sea. Nebo is located at the far north. -nd. And his son replaced him; and he said, "I will also oppress Moab." In my days he said so[…]. Israel. I have built Aroer, and I constructed the military road in Arnon. I have built Beth-Bamot, for it had been destroyed. I have built Bezer, for it lay in ruins. ↑ Jewish History, "House of David" Restored in Moabite Inscription. Retrieved September 29, 2008. ↑ Pierre Bordreuil, "A propos de l'inscription de Mesha': deux notes," in The World of the Aramaeans III, pp. 158-167. Daviau, P. M. Michele, John W. Wevers, and Michael Weigl (eds.). The World of the Aramaeans III. Sheffield Academic Press, 2001. OCLC 201621519. Dearman, John Andrew. Studies in the Mesha Inscription and Moab. Archaeology and biblical studies, no. 02. Atlanta, Ga: Scholars Press, 1989. ISBN 9781555403577. European Seminar on Methodology in Israel's History, and Lester L. Grabbe. Ahab Agonistes: The Rise and Fall of the Omri Dynasty. Library of Hebrew Bible/Old Testament studies, 421. London: T&T Clark, 2007. ISBN 9780567045409. Smelik, K. A. D. Converting the Past: Studies in Ancient Israelite and Moabite Historiography. Oudtestamentische studiën, d. 28. Leiden: Brill, 1992. ISBN 9789004094802.